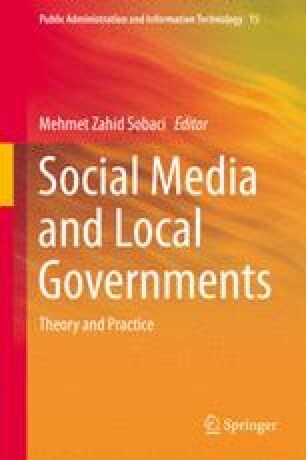 Adopting Social Media in the Local Level of Government: Towards a Public Administration 2.0? This chapter analyses the dynamics of adoption of social media in Spanish local governments with over 50,000 inhabitants. Specifically, the study seeks to respond to the following questions: (1) What are the key factors that explain the use of social media in public administrations? (2) What is the perception of those who manage social media regarding the level of development in their institution? (3) What are the key inhibitors for the development of these technologies in local administrations? This chapter is based on a questionnaire aimed at those in charge of social media in all Spanish local governments with over 50,000 inhabitants (146), which obtained a response rate above 97 % and presents the results through descriptive statistics relating to the defined indicators. The most significant conclusions are, on the one hand, that despite there being a high level of diffusion of these technologies at the level of local administrations, initial actions and strategies for their promotion have either not been clearly defined, or have been inadequately implemented. Second, we are at an early stage of development of social media in the local government sphere. Nonetheless, this is a field of widespread academic interest, bearing in mind the potential for innovation in management and in improved public administration interaction with citizens. This research has been funded by the grant CSO2013-48641-C2-1-R, Spanish Ministry of Economy and Competitiveness, project: A new local architecture: efficiency, dimension, and democracy. Bonsón, E., Royo, S., & Ratkai, M. (2013). Analysis of European municipalities’ Facebook channels activity and citizens’ engagement. Retrieved August 16, 2014, from http://www.aeca.es/pub/on_line/comunicaciones_xviicongresoaeca/cd/84g.pdf. Generalitat de Cataluña (2013). Guía de usos y estilo en las redes sociales de la Generalitat de Cataluña. Retrieved August 2014, from http://www.gencat.cat/web/meugencat/documents/guia_usos_xarxa_es.pdf. Hrdinová, J., Helbig, N., & Peters, C. S. (2010). Designing social media policy for government: Eight essential elements, Albany: The Research foundation of State University of New York. Retrieved August 16, 2014, from http://www.ctg.albany.edu/publications. Urueña (2011). Las Redes Sociales en Internet. Madrid:ONTSI. Retrieved August 14, 2014, from http://www.ontsi.red.es/ontsi/es/estudios-informes. Urueña, A. (2013). La Sociedad en Red. Informe Anual 2013. Madrid:ONTSI. Retrieved August 14, 2014, from http://www.ontsi.red.es/ontsi/es/estudios-informes.